AURONZO, Italy – Faith and reason, mercy and the defense of the truth, dialogue and evangelization were just some of the topics Pope Benedict XVI touched on when he responded to questions posed by the priests of two northern Italian dioceses. Nearing the end of his vacation in the Diocese of Belluno and Feltre, at a villa owned by the Diocese of Treviso, Pope Benedict thanked his hosts by spending two hours praying with and answering questions posed by the dioceses’ priests. The following day, the Vatican released a text of the pope’s answers to questions posed by the priests during the meeting in the Church of St. Justina in Auronzo. The Jesuit said that at the end “it was not just the priests who thanked the pope, but the pope who thanked the priests for their welcome and for the climate” created by the gathering. A priest who described himself as one of many priests who thought they could “change the world” after the Second Vatican Council asked the pope if the council still had value today. However, he said, putting a council’s teaching into practice often requires “suffering, and only in suffering can growth be realized.” Those who pushed an “incorrect progressivism” and those who adopted a stance of “anti-conciliarism” were both wrong, the pope said. “We can see with eyes wide open how much positive growth there has been since the council: in the renewal of the liturgy,” the development of the synods of bishops, diocesan and parish pastoral councils, “the new responsibility of the laity,” a greater awareness of the universality of the church and in the birth of new religious communities and lay movements, he said. In his responses to several questions, including those about morality and about the difficulties people have in believing in God in a world focused on science, Pope Benedict spoke about the reasonableness of faith in God’s existence. The brief video clip released by the Vatican showed the pope explaining how Christians believe that human beings are special precisely because they have a capacity for puzzling over and groping for meaning in a way that goes well beyond concern for their material needs. “The greatness of the human person lies precisely in the fact that he is not closed in on himself, he is not reduced to concern about the material and quantifiable, but has an interior opening to the things that are essential, has the possibility of listening,” the pope said. Pope Benedict also told the priests that evolution and the existence of God the creator should not be seen as two ideas in strict opposition to one another. “Evolution exists, but it is not enough to answer the great questions,” such as how human beings came to exist and why human beings have an inherent dignity, he said. Father Lombardi said the pope had told the priests that when they encounter young people who think science has all the answers and they do not need God, priests should help them see “the great harmony of the universe” and ask if science alone can explain how it all works together and leads to such beauty. “A world without God would become a world of the arbitrary,” the pope told the priests. 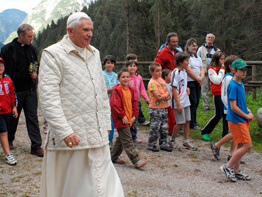 Pope Benedict also spoke about the importance of seeing the need to protect the environment as a moral imperative. “Everyone today can see that man could destroy the foundation of his existence – his earth – and, therefore, we can no longer simply use this earth, this reality entrusted to us, to do what we want or what appears useful and promising at the moment, but we must respect the inherent laws of creation,” the pope said. The pope also told the priests that Christians have an obligation to share the good news they have been given the grace to believe. The proclamation of Christianity involves sharing truths that are fairly simple, he said. It is not a matter of explaining a collection of doctrines, but of presenting the truth and the hope that Christians have found in Christ. When Christians live as people of hope and as people who love their neighbors, he said, “then it is easier to present the source of our behavior” and explicitly offer a witness to faith in Christ.